Conrad Gregor, outfielder for the New Jersey Jackals, became the first CanAm League player to sign a minor league contract in 2017. The Boston Red Sox signed the 5-year vet to a minor league deal and so far he’s been as advertised. Since signing with the Sox, the Vanderbilt alum. has batted .340 in 16 games for the Salem squad (Class A Advanced). Gregor, who’s a career .270 hitter, spent his entire professional career within the Houston Astros organization until this year. He came out of the gate hitting. In his first two seasons he developed a power stroke that contributed to double digit home runs and SLG over .500. Unfortunately, baseball has a funny way of bringing everyone back down to earth. The Astros released him in March of 2017 after a couple seasons where the numbers weren’t quite what they were expecting, but in the grand scheme of things may have been the best thing to happen to him. In Gregor’s first Independent League season, his impact was felt throughout the CanAm League. 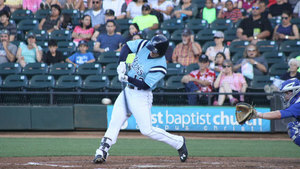 At the time of signing with the Sox he was batting .303/.429/.510 with 12 home runs (5th in league. ), 74 RBI (4th in the league) and 11 stolen bases. In 251 at-bats he only struck out 32 times. Gregor’s innate ability to make contact with the ball and get on base is what everyone wants. The Astros loss is the Red Sox gain.